» Advertising » You&apos;re currently reading "New Guaranteed Views On Login Ads"
Login ads are a powerful tool to use on any site. It’s a great spot to grab someones attention and has been proven over the years to be of high conversions. 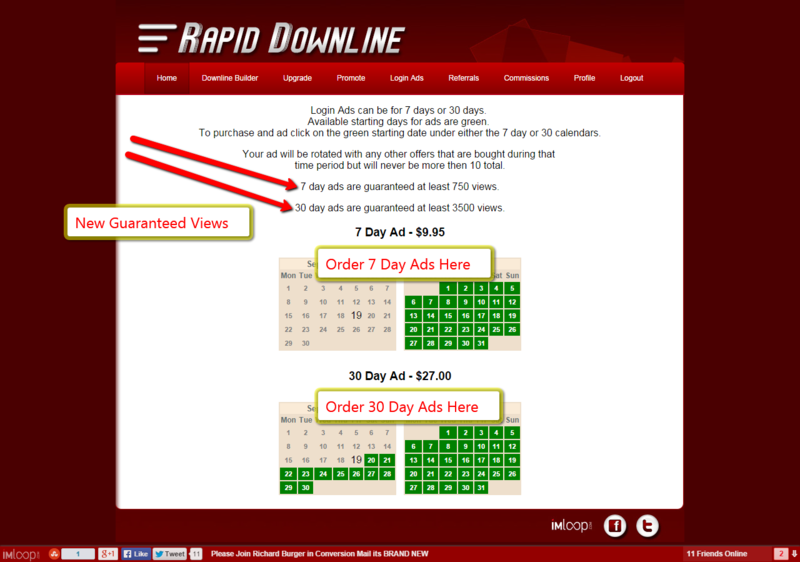 Rapid downline has always offered login ads since it’s launch but there was one key point I thought it was missing and that was to guaranteed ad views on each order. Currently up to 10 login ads can be in circulation at any one time which was cutting down on the amount of views someone revived if more then one advertiser was active. Example 1 – You order 7 days of ads from the dates of 9/20 to 9/27 and during that time frame your ad receives 912 views. You ad would then be considered completed. Example 2 – You order 7 days of ads from the dates 9/20 to 9/27 and during that time frame your ad only receives 645 views you ad would then remain in rotation until it hit at least 750 views before your ad would be considered delivered.